I get the ultimate chance to teach future business leaders about the need for sound economic policies, to actually tackle some of these environmental problems, and also explain that there are lots of opportunities to remedy them. When Arthur van Benthem, assistant professor of Business Economics and Public Policy, came to Wharton in 2012, he found an increasing interest in the energy and environmental markets and a thriving student Energy Club — but not a single energy course on the curriculum. He soon remedied that by creating Energy Markets and Policy, an MBA and executive MBA level course that looks at energy and environmental markets through an economist’s lens. He teaches a similar course for undergraduates: Environmental and Energy Economics and Policy. Before pursuing his PhD in economics from Stanford, Van Bentham began tackling the problem from a different vantage point. He worked in various roles at Royal Dutch Shell, mostly in corporate strategy as an energy economist on the Long-Term Energy Scenarios Team. Ultimately, he decided to pursue a career in academia because he wanted to make more of a difference by influencing decision makers early on. Van Benthem’s curriculum focuses heavily on economic intuition and the incentives that firms, consumers, and governments have in energy and environmental markets. One of the most important facets for him is connecting classroom learning with current events and policy. “Energy is one of those sectors where there’s so much news every day, it’s almost a bit daunting to keep track of what’s happening,” he said. To help students make sense of it, Van Benthem literally brings the industry to the classroom. He has hosted quite a few high-profile guest lecturers, including former Shell president Marvin Odum and David Crane, former CEO of NRG Energy, one of the largest electricity generators in the country. These industry experts share a unique business perspective on economics and regulation with the students, emphasizing energy business models, renewable energy finance, and how energy policy affects their business. In his executive MBA and MBA courses, he reserves more time for students to share their stories about investment in energy because many have worked in energy banking or for an energy producer. “All Wharton students have something in common: they love discussion. They’re not shy, and that’s actually quite similar all the way from the undergrad to the EMBA level,” he said. While most of them are used to looking at energy from a purely technical and financial perspective, Van Benthem pushes them to take a more intuition-based approach and to examine the policy and economics angle. He uses the OPEC game and the electricity strategy game to help bring about that change in perspective. “These simulation games teach the students how difficult these markets are, how hard it is to regulate them, and how some firms can take advantage of extremely constrained supply during peak-time demand events,” he said. The OPEC game mimics the world oil market: student teams represent countries and try to maximize their profits by making output decisions that determine the world oil price. In the electricity strategy game, student teams manage a portfolio of generation units, including coal, natural gas, nuclear energy, and renewables, and bid into an electricity market. Since coming to Wharton five years ago, Van Benthem has made sure that his course design evolves to keep up with the changing market. For instance, he’s gradually increased the importance of the renewable energy sector in the curriculum for Energy Markets and Policy because there have been so many exciting developments in the field. His goal was to create a course that would provide an economic perspective on a broad range of topics that business professionals encounter in the energy industry. Judging by the feedback he’s received, he’s been successful. Another positive sign: Van Benthem received one of Wharton’s Teaching Commitment and Curricular Innovation Awards for the course last spring. While he felt honored by the recognition, hearing about the course’s long-term impact is often more rewarding for him. “Sometimes students email me years later to say how the course turned out to be very useful and as much as I like the award, that’s the best part for me,” Van Benthem said. Many of his former students have gone into the energy sector, tending to lean more on the corporate side. While a fair amount work in the renewable electric energy space, most go into energy investment banking or consulting. Van Benthem’s energy course has some company on Wharton’s curriculum now: Energy Finance. The two courses have been carefully designed to complement each other. Assistant Professor of Finance Erik Gilje, who came on board a year after Van Benthem in 2013, teaches the course to give students a detailed knowledge of corporate structures, valuation methods, project finance, risk management practices, corporate governance issues, and geopolitical risks in the energy industry. Like Van Benthem, his goal is to provide them with a broader context for understanding energy issues and risks, and how these might affect financing and investment decisions both for energy providers and end-users of energy. And like Energy Markets and Policy, the course fills up quickly. Penn, in general, has been stepping up efforts to recruit in energy — and he has been happy to be on the front lines. Van Benthem has worked closely with the University’s Kleinman Center for Energy Policy since it opened in 2014. 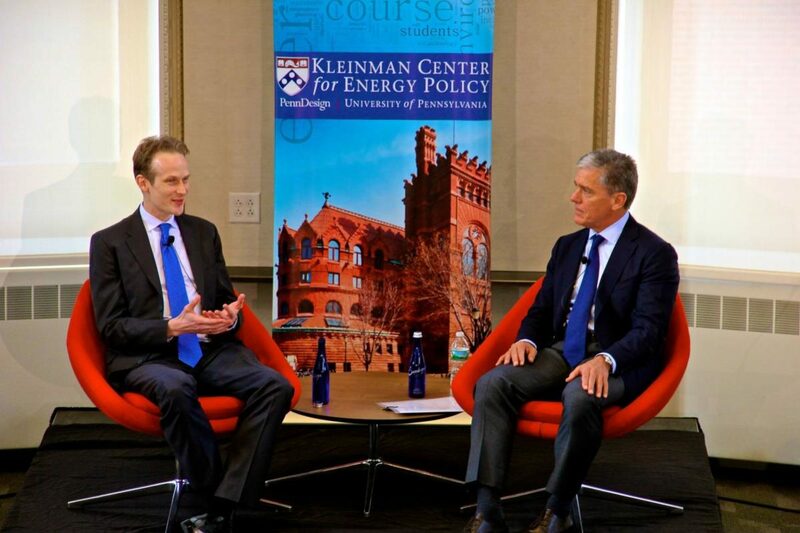 During that time, he’s received two Kleinman grant awards, brought a visiting energy scholar to Penn, moderated and co-hosted several events, and published a Kleinman Center policy digest on fuel economy standards. This year, he’ll be working with the center in a more official capacity: as its first Faculty Fellow. In this role, he will organize and run a new faculty research seminar on energy economics and finance hosted by the Kleinman Center. “My expectation is that energy, environment, and climate change are going to be a much bigger chunk of research at Penn in the next five or 10 years,” he said.